L-1 is a special clothing for using on the places contaminated with poisonous chemicals and emergency chemical hazardous substances. L-1 is designed to protect the skin, clothing and footwear from long-acting poisons and toxic substances, toxic dust, for protection from acids, water, alkalis, sea salt, paints, varnishes, oils, fats, and petroleum products, protection of harmful biological agents in the performance of degassing, decontamination and disinfection works. 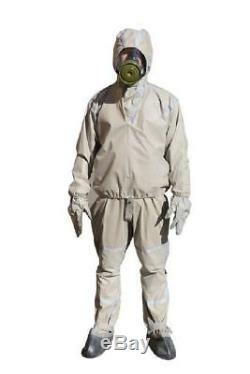 The suit consists of jacket with hood, pants with stockings and protective gloves. The thinner layer of butyl rubber over cotton fabric is the primary reason for its light weight. The L-1 can be used across a broad temperature range from -40 to +40 C.
The L-1 lightweight protective suit can be used in conjunction with gas masks. When not in use, the L-1 is transported in a canvas carry pouch. Like most chemical protective suits, the L-1 provides no protection from gamma radiation, but it is able to block alpha and beta particles. Please write a message with your size. The gas mask is not included. We will reply you ASAP. Our aim is to provide Top Level Customer Service, normally so we will try our best to solve any problem you have. The item "Russian Protective Suit L-1 Chemical NBC Waterproof Army USSR" is in sale since Monday, October 17, 2016. This item is in the category "Business & Industrial\Facility Maintenance & Safety\Personal Protective Equipment (PPE)\Protective Suits & Coveralls". The seller is "originalhandmadeprod" and is located in Ekaterinburg, RU, 620007. This item can be shipped worldwide.